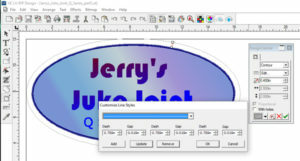 If you sell printed, contour-cut decals, you know that printing and cutting the images is only the first step. Okay, the first two steps. If you’re selling decals, especially at an event like a race or festival, you still have to cut them from the sheet of vinyl to give to your customer. This can be done manually, or with a trimmer. But wouldn’t it be nice if the vinyl cutter could do that for you? If it’s a Vinyl Expess Q Series, Graphtec FC8000 or FC8600 plotter, it can. These advanced machines can perform a standard contour or “kiss cut” around the printed graphic, then cut through the vinyl in a perforated pattern so that you can then pop out the decal and hand it to your customer for them to apply whenever they choose. It’s called Perf cut and it’s pretty nifty option, especially for on demand decals. So how does it work? The Perf cut process is similar to the standard print and cut workflow, but with a couple of added steps. We’ll need to add a couple of steps to the design process and a couple more to the cutting stage. Since most of our customers use SAI’s FlexiSign & Print software for design and production of digitally printed graphics, these directions are based on the use of Flexi. You can do the same thing in Vinyl Express LXI RIP 12, which supports the PrismJET VJ24, VJ24X, and VJ48 printers. LXI RIP 12 also has drivers for all the Q Series and Graphtec plotters mentioned here. In this article, we’ll focus on the steps peculiar to the perf cut process. It’s assumed that you are already familiar with the basic print and cut workflow. But if you need a quick refresher, you can review our online tutorial in the Technical Support Knowledge Base. This can also be done using Graphtec’s Cutting Master 3 plug-in and a separate design application such as CorelDRAW or Adobe Illustrator. 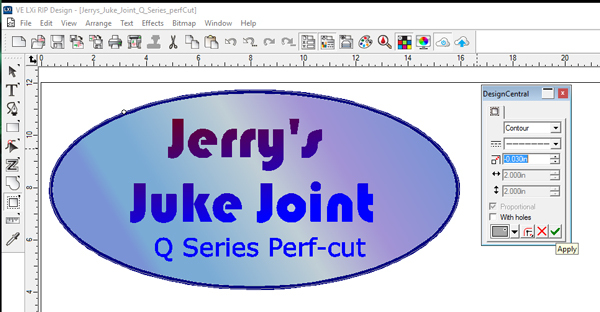 For directions on how to create a perf-cut graphic in Cutting Master, please visit Graphtec’s online video tutorials. Okay, enough with the overview. Let’s get to the nitty gritty details. As noted above, the process begins with the design of a print and cut decal using FlexiSign & Print or LXI RIP 12’s contour cut feature. You import the raster artwork, make the background transparent, then apply the contour cut path with the desired offset or choke. Once we have the contour cut path created, we separate the contour cut, then create a second one, preferably with a generous offset. If you’d like, you can use the space between the two cut paths to add information you’d like your end user to have before they peel and apply the decal. In this case, we’ll use a decal I designed for our PrismJET VJ24X Webinar. 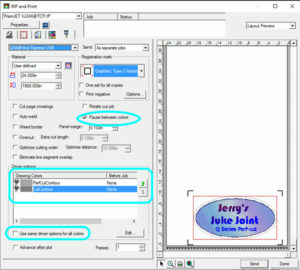 As you can see in Fig 1, I’ve added a note designating what media the image is printed on and telling the end user to peel it just above the text. When you apply the second contour cut, you’ll need to change the path from a solid to a perforated line. In the Design Central Contour Cut toolbox, the second window from the top is the Stoke Style window. Click on the arrow at the right of the window to open the drop down menu for various standard line styles. You’ll see that most of the options are different perforation patterns. I’ve found that none of these are really ideal for pop out decals, but that’s okay because we can edit one and optimize it. Fig 2: The Customize Line Styles window lets you optimize the perforation pattern by entering values for the dashes and gaps. Select a perforated line style from the drop down list. Then right click to open the drop down menu again and, from the bottom of the list, select “Edit”. This will open the Customize Line Styles window (Fig 2). Here, you can optimize the perforation pattern by entering specific values for the dashes and gaps. The dashes are the sections the blade will cut. The gaps are the sections it will leave intact. It is tempting to create a pattern with long dashes and a few short gaps so it will be very easy to pop the decal free after it’s been cut. But a graphic with very long dashes allows the decals to begin lifting from the sheet of vinyl as the plotter is still working, and raises the possibility that the cutting head will strike and damage the decals. It’s an interesting spectacle, but not good for productivity. I’ve found that 0.75” dashes and 0.010” gaps work well for a 2” x 9” decal. Now that you’ve created and optimized the perf cut path, you’ll need to manage the two cut paths so you can send them to the plotter separately. This is done by applying one of Flexi Sign’s most basic tools: cut by color. Assign different colors to the two contour cut paths. In our example, we’ve chosen green for the first contour or “kiss cut” and red for the second or perf cut. This is easily done by separating the contour cut, then selecting it and changing the stroke characteristics using the Fill/Stroke editor. You may also opt to name them CutContour and PerfContour and leave the stroke color the same. These labels will also be visible in Production Manager’s Contour Tab. 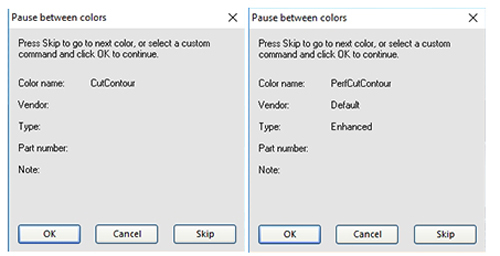 When the job is sent to Production Manager, you will see both paths in the Drawing Colors window and will have the option to direct the RIP to pause between colors. Note: Whatever method you choose, remember to separate the contour cut paths before the RIP and Print command. This will allow production manager to see both. If you create two cut paths, but only see one in Production Manager go back and separate the paths. 2nd Generation Q Series have a dual position tool carriage and a trough directly in front of the Teflon cutter protection strip. Before we convert our digital file into ink on vinyl, we need to configure the Q Series plotter for the dual path cutting. 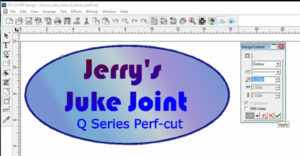 Newer, second generation Q Series vinyl cutters are engineered for this capability. They have a dual position tool carriage and a trough directly in front of the Teflon cutter protection strip (Fig 4). 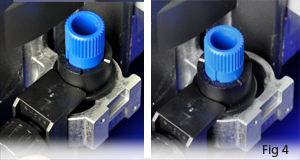 The forward position in the tool holder places the blade above the trough to support cutting through the media without damaging the cutter protection strip. Cutting through the backing paper into the cutter protection strip will eventually lead to degraded cutting quality and tracking. So the first contour cut will be performed with the blade holder in the rear position. The perf cut will be performed with the blade holder in the forward position. We’ll need to set the proper cutting conditions and perform a test cut to make sure we have the optimal depth for both processes. We’ll use two different conditions settings. Our SGIA Decals were printed on 3 mil PrismJET 203 glossy vinyl, so I programmed Condition 1 with the cutting force set at 17 and the speed at 50. To cut through the media for the perforation, I programmed Condition 8 with the cutting force at 35 and lowered the speed setting to 30. Then we use the arrow keys to navigate to Condition 8 and press the #3 to select the forward tool which is tool #3. Because we’re using two different tool positions, we need to designate that in the control panel. We’ll use the standard tool position for the contour cut (Condition 1) and the alternate, forward position for the perf cut, which is allocated to Condition 8. We do this by opening the Conditions menu and navigating down to the second page. Press button #3 to access the Assign Tools Menu. Then we use the arrow keys to navigate to Condition 8 and press the #3 to select the forward tool which is tool #3. (Number two is the optional second penholder). (Fig 5). This step allows us to maintain perfect alignment between the printed image and both contour cut paths, despite the fact that they’re performed from different positions relative to the print. It’s a thing of beauty. Since we need to cut all the way through the face film, adhesive, and release liner, I opted for a 60° blade in a separate blade holder for the perf cut. This also makes it easier to quickly change from one operation to the other. FIG 6: Check Pause between Colors, to automate the sending of different cut paths to the vinyl cutter. Note the cut path labels. As noted above, when you open the Contour Tab, you will see two cut paths indicated at the bottom of your screen in the Drawing Colors Window. Make sure to Check the “Pause Between Colors” box located just below the Registration Marks window (Fig 6). This will allow you to send the cut paths one at a time with a pause between jobs to allow you to move the blade and change the cutting conditions as instructed above. 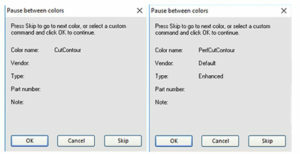 You can select which color you want to cut first by selecting them in the Drawing Colors window. Start with the one associated with the kiss cut. This will be the path closest to the contour of the printed image. Start as you would a normal print and cut job, by sending the print file. Then cut the printed graphic from your printer, remembering to leave about 4″ of media behind the rear registration marks to allow the cutter to scan all four marks. 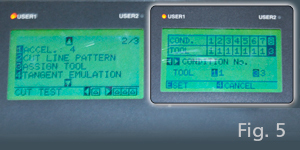 Load the media on your Graphtec or Q Series cutting plotter as you would normally. Set the Origin point, ensure that the blade is in the rear position in the blade holder, and that the Cutting Conditions are set for the kiss cut. Fig 7. Flexi or LXI will pause between cut jobs to allow time to change blade settings, and allow you to select one cut path or the other. Cut by Color, Production Manager will display a screen asking which color you want to send. (FIG 7). This is an extra step allowing you to make sure the cut paths are cut in the order you want. If the color presented is the right one, click OK to send the cut job. If the color presented is the wrong one, simply click Skip to cycle to the one you want, then click OK. The plotter will begin the automatic registration mark sensing and then automatically start the work of adding the kiss cut to your prints. When the first contour cut job is done, change the plotter to the second Conditions setting; in this case, we went from Condition 1 to Condition 8. Move the blade holder from the rear to the front position in the tool carriage (or remove one and insert the other as I did). Return the blade to its starting position near the first registration mark. There’s no need to reset the Origin Point. Open Production Manager, select the cut job and hit Send again. Select the right color for the per cut, acknowledge that you have set the Origin Point, and click OK. The plotter will add the second contour, cutting through the face film and liner in the perforation pattern you created in Flexi Sign & Print 12 or LXI RIP 12. Now you have a fresh batch of pop out decals ready to dispense to your customers. Creating pop out decals takes a little more time than a standard print and cut process. Despite the length of this blog post, it really only requires an extra five to ten minutes to set up such a job. The benefit is saving of all the time it would take to manually cut each decal from a large production run. You can also design the perf cut to echo the contour cut so that the entire product retains the shape of your design, making it more appealing and more valuable. This is an ideal process for producing large volume wall graphics, bumper stickers, automotive window stickers, or a host of other retail oriented peel and stick decals. Try this on your next large decal job and let us know what you and your customers think.